If you’re trying to research which roofers in Lexington, KY have a good reputation, then you’ll want to be sure to look for these 5 qualities that can make the difference. This may sound like an obvious thing to consider, but just how transparent is your roofer willing to be about their reputation? Let’s look into what areas and outlets they can offer such transparency. Facebook is one of the more trustworthy sources for inquiring about any company’s reputation. If the company you’re researching is legitimately putting their best foot forward and is aiming to shine in the public’s eye, then you’ll find the type of transparency you’ll want. Here’s an example of our transparency and reviews on Facebook. 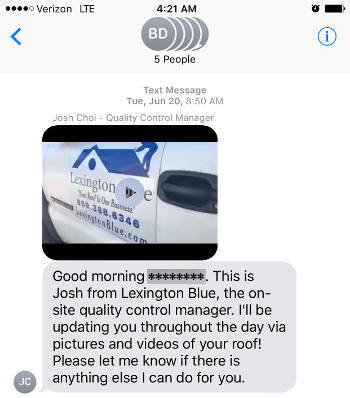 When it comes to defining who the best rated roofers in Lexington are, then Google should be at the top of the transparency list. A company who has a focus on their reputation should easily be known and reflected in their Google Reviews. You can find ours here. When most consumers consider a company for their services, then BBB is usually another on the radar for investigation. While most service providers only have a few things being said about them on BBB, it’s usually negative. If they can boast about how many positive experiences their clients have had, they should easily be able to prove it. Most homeowners aren’t strangers to dealing with a contractor who doesn’t communicate well. We know it’s frustrating! At Lexington Blue, our entire staff is not only trained to communicate well, but takes satisfaction in doing so. Here are a few examples on how your roofer should be willing to communicate with you regarding your project. The idea of having a crew come out to tear off your existing roof and replace it with a new one may sound simple enough, but there’s so much more to it. Your roofer should be willing to invest all the time necessary to ensure you have a complete understanding of the entire process. This should include any and all variables of your insurance claim if you have one, the type of products and materials being used on your home as well as the expectation on how the procedure will take place. Another communication quality you should look for is if they provide realistic time frames regarding the scheduling of your project. Our company is fortunate to have a well versed staff. Each role within our organization is responsible for communicating scheduling expectations with our clients. You can expect to not only receive a welcome call, but also be promptly kept up to date on realistic dates and times. This may include weather or material delays etc. No homeowner should be left in the dark regarding how their project will be performed. When you’re researching your roofer, you should have no question as to what methods will be implemented, nor should you have to question how the entire process will take effect. A final quality of communication to consider in your decision should be whether or not they offer real time reports of your installation. You may not have the luxury of being on site at your home due to work requirements. 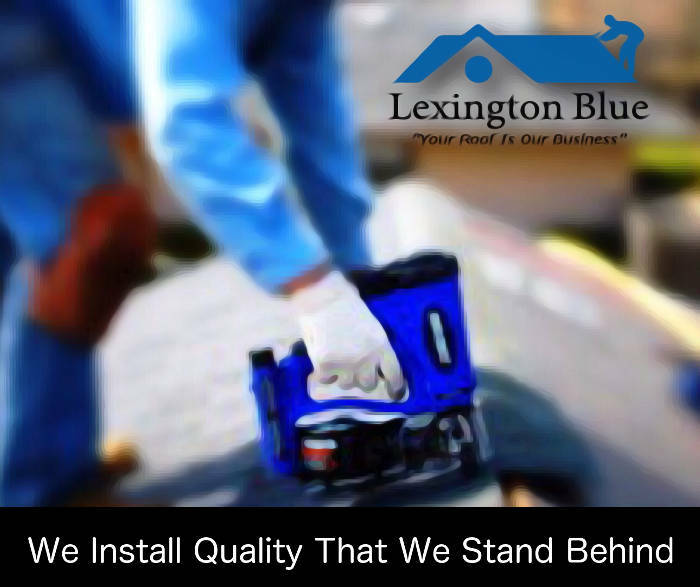 With Lexington Blue you’ll never have to wonder how the work is being performed because we offer real time reports with text messages that include progress reports and pictures. Here’s an example. We notify you as we begin your project. Another example of the progress as it’s being performed. Even the best roof installers can’t compete if the products they use aren’t worthy. This next quality you should look for isn’t so much about the roofer themselves, but rather the quality of the materials and shingles they use. If you’re like most of our clients, you take pride in your investment. This shouldn’t be cut short by using poor quality roofing materials. We only use the best roofing products on the market to ensure your home is well protected and looks outstanding. This means yes, we sacrifice our profit margins by using the highest quality materials vs. cutting corners for a few extra bucks. Owens Corning is our brand of choice. With proven industry innovation and nearly 40 plus years of delivering quality, they are a brand we can stand behind. As a homeowner who wants the best, you should look into a roofing company who only installs the best! When your roofer makes the installation, each part of the process should be well documented. This not only provides you with assurance, but it’s also important in terms that regard your warrantied materials and products. So another quality to consider when deciding on who to hire to repair your roof is to ask if they offer documentation on the installation itself. In doing so you’ll have peace of mind in knowing everything was installed correctly and your warranties are in tact. Most roofing companies you’ll find in Lexington all say they offer warranties. Most of these so called warranties are nothing more than what the material and product comes with that is already offered by the manufacture. The quality you should probably care about the most is the personal warranty they are willing to stand behind that actually reflects their workmanship. We offer all traditional and standard warranties that the manufacture offers, but we also offer our own 5 year labor and workmanship warranty as well. This gives our clients an extra added layer of assurance that we are going to stand behind what we offer. It’s one thing to boast about what you’re capable of, but if it’s a value to our clients, then we have no shame in doing so. You can expect each of the qualities we recommend you consider as standard practice when you hire us to install or repair your roof. Our commitment is not just to provide a quality service and experience, but to also continue striving for new ways to improve on it. We look forward to meeting with you in person to prove we stand behind what we believe in. 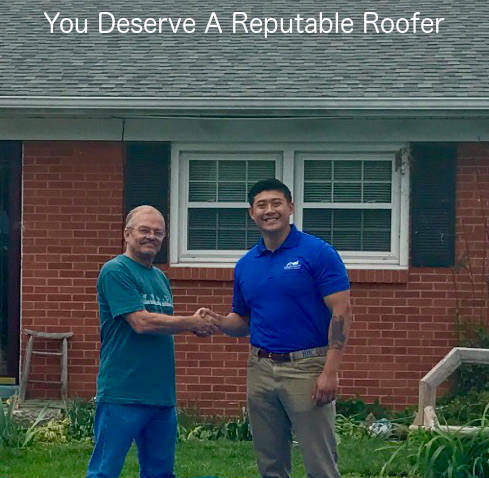 When you want a roofer in Lexington with a good reputation, consider Lexington Blue!